I’m against obnoxious, far-left U.S. Senator Barbara Boxer as much as the next person with a brain. And I hope a good, solid conservative beats her in the 2010 elections. But, with liberal, failed former Hewlett-Packard CEO Carly Fiorina in the lead, that person has yet to emerge big (it’s Chuck DeVore, who doesn’t have quite the money the others do). And it certainly isn’t liberal, pan-terrorist former Republican Congressman Tom Campbell. If you live in California or know those who vote there, please do everything you can to stop this man. It’s not just that Campbell was one of the most liberal Republicans in the House of Representatives. It’s much more important than that: Campbell was the Islamic terrorists’ best friend in Congress when he served. Campbell, as I’ve noted before, is a friend of convicted Islamic terrorist and Islamic Jihad founder and frontman, Sami Al-Arian. He did everything in his power to stop Al-Arian from being convicted or deported. He was also one of the most anti-Israel members of Congress and the most pan-Muslim. The alphabet soup of Muslim interest groups–CAIR, MPAC, ISNA, MAS–all knew that Campbell was their go-to guy and even placed extremist Muslims (redundant) as staffers in his office, including the son of an Al-Qaeda fundraiser! When [Sami] Al-Arian was fired from the University of South Florida, from which he ran his terrorist network, Campbell wrote a letter of support praising Al-Arian and asking the University president to reconsider her decision. In the letter, Campbell noted that Al-Arian helped him raise money for his failed U.S. Senate bid. [Campbell’s] donors have included Nihad Awad, executive director of the anti-Israel Council on American-Islamic Relations (CAIR) . . . .
Other Campbell donors, besides Al-Arian, included Muthanna Al-Hanooti, an official of an Islamic charity that is a major donor to what the FBI identified as HAMAS’ Jordanian operation [DS: Since I wrote this, Al-Hanooti was indicted as a spy for Saddam Hussein]; and Tariq Hamdi, an Al-Arian associate, who was indicted last month on immigration and mortgage fraud charges and has fled the country. According to testimony in the trials of perpetrators of the 1998 U.S. embassy bombings, Hamdi provided the satellite phone battery to Osama Bin Laden that was instrumental in those bombings. 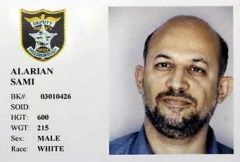 Another donor, Abdurahman Alamoudi, was captured on video in front of the White House announcing his support for HAMAS and Hezbollah. . . . His indictment connected him with assorted Islamic terrorist groups and activities. Those are Campbell’s donors. Then, there are Campbell’s former employees. Suhail Khan held several key positions for Campbell, including Press Secretary and Policy Director. But Khan is an Islamist who invited terror supporters and anti-Semites to the Bush White House (where he once worked) and whose father brought Al-Qaeda leader Ayman Al-Zawahiri into the United States to raise money for Al-Qaeda. His father, Mahboob Khan, late founder and head of the Santa Clara Mosque, brought Zawahiri into the U.S. twice on a fake passport in the mid-’90s to raise money for Al-Qaeda. . . .
With a policy director like Suhail Khan, it’s no surprise that Campbell consistently voted against Israel while in Congress. That’s the shortened version of what I wrote about Tom Campbell in 2005. Read the whole thing. Sadly, five years later, Tom Campbell is still around. And he’s still around because–contrary to their claims–far too many Republicans still embrace pan-jihadists and supporters and enablers of Islamic terrorism. Campbell was even a top official in Gov. Arnold Schwarzenegger’s administration. That he’s even considered a viable candidate for anything and hasn’t been ushered out of any hopes of future political office puts the lie to any claims that Republicans are tougher on terrorists and anti-Semites than Democrats. And, like I said, the Republican Jewish Coalition was all set to host Campbell at an event until I blew the whistle. The RJC has a predilection for Israel-haters and anti-Semites. But, sadly, the Republicans do, too. And that is growing as Republicans whore themselves out to get Islamic votes. It’s happening all over the country, and it happened repeatedly, here, in Michigan, as then-Michigan Republican Party Chairman, Saul Anuzis, recruited an anti-war, Shi’te Muslim, open supporter of Hezollah (Nasser Beydoun, who now lives in the United Arab Emirates) to run for the U.S. Senate, and told me he would try to get as many pro-Hezbollah Shi’ite votes as possible and do what it takes to get them to vote Republican. Republicans need to learn that becoming a majority party doesn’t mean you open your mythical big tent so wide that even open supporters of Islamic terrorists are acceptable and welcome. There needs to be a zero tolerance policy there. But there isn’t. Or Tom Campbell would long ago have been history. Don’t bet on Republicans breaking a fingernail over pan-jihadism in their midst. It’s only when it’s on the other side of the aisle that they give a damn. And always bet against the empty slogans of Republicans who claim to be against terrorism, but do nothing to excommunicate–and everything to enable and promote–the pan-jihadists on their side of the aisle. Is the GOP really the party of counterterrorism? With Tom Campbell still comfortably in its fold and boldly planning to run for Governor on the elephant party’s ticket, not really. And, with a record like his, if I were the California Democrats and Barbara Boxer, I’d pray that Tom Campbell becomes the GOP nominee. Don’t leave it up to the Republican Party. Do what you can to stop Tom Campbell. Tell your friends in California, and if you live there, tell everybody. The only real Conservative running in the Primary is Chuck DeVore. He’s only polling around 8%, but, that’s only because he doesn’t have Fiorina’s or Campbell’s kind of money backing him. Spread the word, it’s Chuck DeVore. The GOP is infested top to bottom with liberals… Tom Campbell in California, Mark Kirk in Illinois and the picture goes on and on. The GOP isn’t showing zero tolerance for folks who aren’t even conservative in name. Thanks! I’ve never been a fan of his, but thought he was a lesser evil compared to so many others in this state. I had no idea about his extremist supporting background. I could tell by his voting record it probably wasn’t too far off the other Communists we elect in CA, but wow! THANK YOU!! Don’t end there, just follow the swastikas. R or D, makes no difference, BOLO the deeply embedded fascists everywhere. … follow the swastikas , all the way back to Tampa FL, and Sacramento, CA. If you need a guide book, just let me know. Debbie, the Muslim guy who beheaded his wife is pleading “innocent,” saying she was the abuser. Playing the “victim card.” Whoever who have thought? Well said. Campbell is beneath contempt. But this is the trouble when the conservative movement does not have effective leadership. The battle against each loathsome Republican has to be fought on an individual basis. As you said, it’s not just the RJC, it is the Republican National Committee as well that will probably support him. California certainly has its share of pro-Jihad Republicans. Mr. Campbell is a classic RINO that the Republican Party, especially in California, seems to be quite enamored with. Realistically, one cannot expect to have true blue conservatives in run in every state, much less in every race. However, there should be a floor beneath no one can fall and still be called a Republican. Otherwise, you will get someone like Deidre Scozafava or Millicent Fenwick from an earlier era. Such people are worse than useless, since they are deliberate counterfeits who show their true value at the worst possible times. Who needs another false friend? Debbie; You and others here, not being from California of course (like I am) have NO IDEA what it will take to get a Republican elected here! First, Boxer has a massive re-election war chest. DeVore has a pittance (even less!) compared to her, but that’s not the main problem. The main “problem” with DeVore (and yes, I DON’T CONSIDER it a problem personally…just strategically) is that he is a “no-name” social-conservative from Orange County, CA. NOBODY in the liberal north will give him a second look! Period. He is Babs Boxer’s DREAM candidate in the general! She will wipe the floor with him because he will NEVER attract the Reagan-dems and center-left voters needed to win here. Please…STAY OUT of California politics and let us work towards getting rid of Boxer with someone who actually has a CHANCE. Not saying Campbell is my candidate either…but your pan-islamist fears about him fall on deaf ears if it means Boxer will be elected again! Are you going to go for someone who calls himself a Republican, but is in fact no such thing? That was the attitude in New York State with Deidre Scozafava. In the end, she demonstrated her loyalty to her party by promptly endorsing her former Democratic challenger. Does California really need another emtpy suit, like Pete Wilson was? WRONG DAVE DeVore’s biggest support group is in the Bay Area they even had phone banking for Scott Brown in MA. They had grassroots supporters with boots on the ground in MA. I’m in the Bay area and trust me, people are SICK to death of Pelosi, Boxer and Feinstein. We can do this. DeVore needs out-of-state help just like Brown had. Get serious and help us. I’m CA born and raised. I know with which I speak. Debbie, is 100% right. 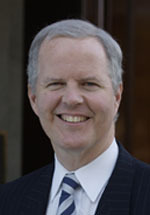 Tom Mclintock endorses Chuck DeVore. If Debbie and Tom agree on something take it to the bank. It is solid gold 24 Karat. Cha-Ching. I’M ALL IN!! Dave you are the same fools who voted for Arnold saying Tom McClintock wouldn’t win. Give me a f**cking break. Arnold destroyed the Republican Party in California. HELL IF ARNOLD WAS WINNING LET ME LOSE EVERY TIME!!!! Every liberal action he took is blamed as a Conservative mistake and the SOB is far from Conservative. So the Republican party gets no traction in California because he is wearing liberal slippers and a Republican badge. Now we have a chance after Obama to make some traction. Similar to Gray Davis, the people wanted a fiscal Conservative and ousted him and Arnold got elected. The fool grew government more than Davis, protected illegals and protected the HOMOSEXUAL agenda. Fiorina and Campbell are RINOs and DeVore is my choice. If DeVore is not the choice, the American Independent Party looks more appealing. Ideally Chuck DeVore will California’s next Senator (or another staunch conservative candidate of either party), but if that’s not possible, and it comes down to Barbara Boxer vs Tom Campbell, I believe that Boxer would actually be the lesser of the two evils–and I don’t like her either. Under no circumstances are we to knowingly elect anyone who is eiher anti-Israel and/or pro-Islamo-Fascist or its allies–CAIR, etc. Kudos to Debbie for keeping us informed as to who the bad guys are, regardless of party. Arnold, and Pete Wilson a decade earlier, destroyed what WAS a very good and effective Republican Party with their left of center politics. pre-Pete Wilson, California, more often than not, had one GOP and one Dem Senator. Sometimes both Senators would be GOP. Ronald Reagan wrote the blueprint on how a Republican can win a statewide election in California. It’s called conservatism. Chuck DeVore IS the one true conservative in the field. He CAN win the primary if he is able to overcome both Fiorina’s and Campbell’s war chests. DeVore has an advantage that Bruce Herschensohn (who lost to Boxer in the general election in 1992 due to a malicious lie just before the election) didn’t have in 1992: he has Facebook, Twitter, and the New Media to respond quickly to attacks on his character. In the meantime, the RINOs infesting the state GOP need to be purged from leadership. DeVore is the real conservative here in California. He has an uphill battle,but there is time. He needs to go on local California,talk radio and get his message out. Savage,Inga Barks and many others. Meg Whitman who is running for Governor here has been running ads the last four or five months on conservative talk radio but she is using her own funds. Hoffman in New York, Brown in Massachusetts, they overcame huge odds, so it can be done.DeVore needs the funds,Boxer has a huge war chest, she is part of the establishment machine. I would love to see Boxer go back to Brooklyn and go to work in a brassire shop! Go Barbara Boxer? I’m depressed. Actually, bad as Barbara Boxer is, she did rescind an award she had given to CAIR or some other Islamic organization when she found out about their Jihadi links. That too in response to something in World Net Daily, a site she had zero backing in and could easily have ignored. As a Republican, I disdain her, but I’d pick her any day over Republicans who are lukewarm towards Mohammedans, period. Talk about holding my nose while contributing. The pain, oohh the pain. Wish there was a veteran come home to vote for there. The Field Poll just recently published is fatally flawed. The group that polled it has Prop 8 failing by 17%. We all know what happened there. The latest Rasmussen poll had Chuck DeVore only 6% pts behind Boxer. That is far more reliable. You’re right Debbie. DeVore is the ONLY candidate with a voting record to prove that he means what he says and says what he means. He isn’t endorsed by the Howard Jarvis Taxpayer Association for nothing. That is hard to come by. Also Independence Caucus which has one of the most stringent vetting process of any group in the nation. You are right. DeVore is California’s Scott Brown. Thank you, Debbie. I never much liked Campbell, because he always felt phony, but I did not know he was an Islamic enabler. In terms of Suhail Khan, he was a graduate of Santa Clara University in California with a degree in US Law. I am assuming you are saying there were no background checks performed on those working in a sensative area. His responsibilities in Domestic Relations would have included inviting people to the White House. I would think that fact checking would benefit both your posts along with credibility. The vote by Tom Campbell on moving the US Embassy from Tel Aviv to Jerusalem is being condemmed as anti-Semitism which upon further scrutiny doesn’t make sense. A no vote indicated saving the money for the move and since it wasn’t going to happen anyway, it didn’t make sense to support a bill such as that. Again, I would suggest some fact checking.